COMPLETED EVENT– KHENPO PEMA WANGDAK TEACHES AT EWAM CHODEN ON OCTOBER 24, 25, 26– Sojong & Lojong and more….. There is a great weekend of teachings & practice with Khenpo Pema Wangdak at EWAM CHODEN. FRIDAY, OCTOBER 24 AT 7:00 P.M. REQUESTED DONATION—$15.00 Dana (offering) to the Lama is separate. The enduring positive effects of peace, loving-kindness, and compassion, and everything else that is good in human nature—its values and ethics, its aspirations and goals—are possible only when combined with the strength of the power of patience. Without that strength, these values, profound and noble though they may be, are often seen to be fragile and frail, and thus are neglected, ignored, and misunderstood even by those who aspire to live by them. Drawing on the teachings of Buddha, the virtues of patience, in the length and depth of its meaning, will be presented as an indispensable component of and the very key to a successful life, spiritual or mundane, and every meaningful thing we do: at home, at work, in social life, education, health, and all else that is conceivable. Our measure of accomplishment is fundamentally based on a solid foundation of patience. 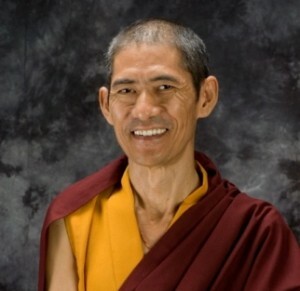 INFO FROM KHENPO PEMA—-The three most influential Lojong texts—Parting From the Four Attachments, Eight-Verse Lojong, and Seven-Point Mind Training—which have sustained the spirit and purpose of life for millions over the centuries, will be reread, reviewed, and reflected upon, accompanied by step-by-step alternating meditation throughout the day. We will do this as a reminder, as well as an introduction for those who are new to the Lojong teachings, that everything worthwhile in this world and in our life is rooted in the spirit of compassion and kindness that is nurtured by joy of life and equanimity of mind. There will be group practice sessions for beginners and experienced students alike. The daily schedule will consist of alternating periods of teaching, practice, and guided meditation, with a personal audience with Khenpo Pema. Dedicated practitioners, believers and nonbelievers, the curious as well as beginners, all are welcome to attend this weekend meeting. REQUESTED DONATION AMOUNT — $40 per day or $60 for both days. Khenpo Pema Wangdak was born in Tibet and escaped to India as a child in 1959. Having graduated from the Central Institute of Higher Tibetan Studies in Benares, India, he received his Acharya (masters) degree from Sanskrit University in 1980, while studying with the highest Sakya Lamas.. In 1982, he was sent to the West by His Holiness Sakya Trizin, as the first of the younger generation of Tibetan teachers in America from the Sakya School.